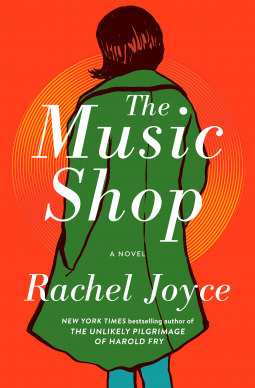 Rachel Joyce’s newest novel begins with this simple line, “There once was a music shop.” No, this isn’t a fairy tale; instead, what follows is a complex journey of two people on the backdrop of a soundtrack that’s equally as eclectic as they are. It’s the 1980s and Frank believes that music can heal people, and he has a knack of begin able to find just the right piece for whatever that person needs. However, Frank also believes in vinyl and refuses to sell anything but them in his shop, despite the music industry’s growing adoration of CDs. However, with his accident-prone helper Kit, and a slew of oddball neighbors with them on Unity Street, it looks like this fading neighborhood is the next up for developers and their dreams of gentrification. Into all this walks Ilse, who immediately faints and thereby changes Frank’s life as well as that of everyone else. If you’ve ever read any Joyce (and in particular the companion novels, Harold Fry and Queenie Hennessey), you’ll already know that despite the fact that she uses one of the oldest and mundane basic plots on earth (boy meets girl, etc. ), her creative genius lies in her ability to grab her readers with the most quirky and lovable characters we could ever imagine. Although Joyce’s second novel, Perfect, strayed from this formula, this newest work does not, and I’m not complaining even one tiny bit. In fact, what Joyce achieved with both Harold and Queenie in two separate novels, she’s surpassed with Frank and Ilse in this one book. One can easily compare and contrast these two sets of relationships. Although Ilse, unlike Queenie, isn’t on her deathbed, she does have a medical problem but thankfully, it isn’t fatal. Unlike Harold, Frank doesn’t walk the length of Britain to see Ilse. However, Frank does go on a type of journey, but it is an internal one. At the same time, Frank attempts to help others onto better paths through his deep insights into what music will take them there. Remember too that Harold and Queenie both told their stories of their relationship in retrospect. In this book, Joyce tells Frank and Ilse’s story as it happens, beginning their meeting in 1988, and continuing after a 20-year gap in the narrative. Furthermore, in both Harold and Queenie, the primary focus was on those two protagonists, with all the minor characters almost exclusively in the background (practically as footnotes). Ilse and Frank have quite a number of predominant supporting characters (along with a mostly unseen real estate development company) playing significant roles in both helping and impeding their relationship. In fact, one of these characters is practically a third protagonist, but she only appears in a few chapters of her own and as small reminders elsewhere, yet her impact on Frank, and through this also on Ilse, is enormous (sorry, no spoilers). Aside from this, what all three of these books (as well as her other novel and her short stories) have in common is how Joyce succeeds with such grace and deceptive simplicity of prose to make us fall in love with such obviously flawed, tantalizingly unusual, yet amazingly ordinary people. Yes, I know this sounds like an oxymoron dream fest, but that’s Joyce – she knows how to combine all these things to make characters that (excuse the cliché) practically jump off the page at her readers. Joyce also knows how to build a plot around these characters where they can work through various obstacles, which adds to these characters’ development. Here too, Joyce likes parallels, for example, Frank’s insistence on only selling music on vinyl (that at the time many thought would eventually become obsolete) echoes the neighborhood “Unity Street” where he has his shop, where a property developer is trying to buy out all the residents. It was as if Joyce was trying to say that modernity may influence many, but some steadfast people will always survive with their principles intact. As you can see, I thoroughly adored this novel, and of course, I will highly recommend it. Mind you, if you don’t have a huge batch of tissues when you get to the last handful of pages, you’re going to make a mess of your sleeves – BIG TIME! As I’ve said before “Hello, my name is Davida, and I’m a Rachel Joyce addict,” and this book only increased this wonderfully delightful habit for me – so I can’t give it less than a full five out of five stars! 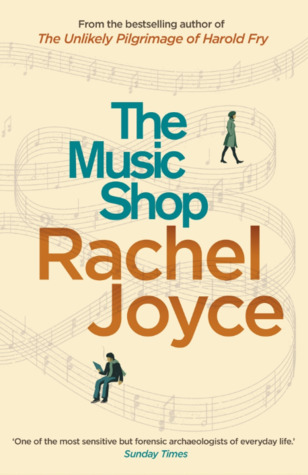 “The Music Shop” by Rachel Joyce is available (via these affiliate links) from Amazon US, Amazon UK, Amazon CA, Barnes & Noble, Kobo eBooks (USA, Canada & Australia), NEW – Kobo Audio books (USA, Canada & Australia) eBooks, iTunes (iBook or audiobook), The Book Depository (free worldwide delivery), new or used from Alibris or Better World Books (where your purchase supports literacy) as well as from an IndieBound store near you.